Archive creates a copy of specified files and stores them for a designated interval. Retrieve copies archived files from the storage pool to the client node for use. The retrieve operation does not affect the archive copy in the storage pool. You can archive multiple files, directories, or subdirectories together. Archiving is processed differently from backup. An archive copy is stored on the server regardless of change status or frequency of backup. Archive and backup each use a separate copy group so that each management class can handle the differences between backup and archive. You can group files by description for easy retrieval. You can add a descriptive tag onto a file for easy retrieval. Preserve files for later use or for records. 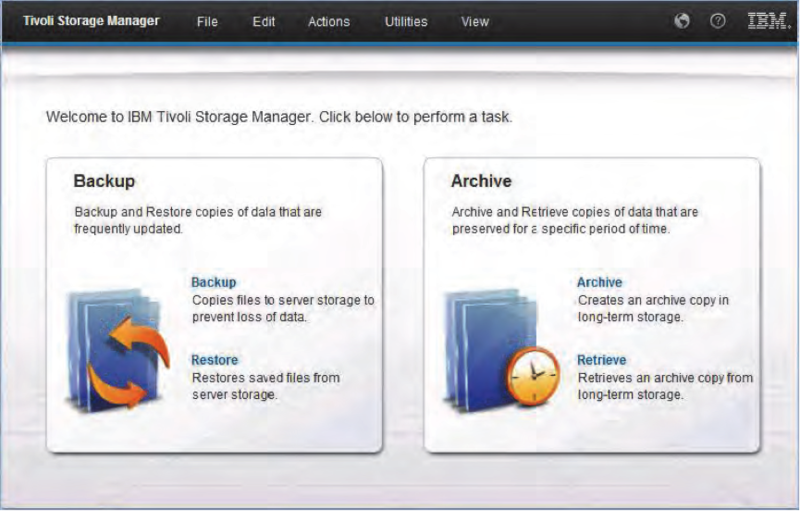 Request Tivoli Storage Manager to copy files, subdirectories, and directories for long term storage on media that Tivoli Storage Manager controls. Let users choose to have Tivoli Storage Manager erase the original files from their workstations after the files are archived. Do so with caution. Use Tivoli Storage Manager to archive packages that identify groups of archived files. For UNIX symbolic links, archive the file that the symbolic link points to, but under the name of the symbolic link. Use Tivoli Storage Manager to retrieve the directories first, and add the files to the directories. Retrieve archived copies from the directory tree. Use filters to identify copies from the directory tree. Let authorized users retrieve archive copies of files that someone else owns. When files are archived by using the backup-archive client, an archive description is required. The archive description is a text field that contains information relevant to the files and directories that are archived. Tivoli Storage Manager stores the archive descriptions in a new format internally in the Tivoli Storage Manager database. The backup-archive client supports archiving and retrieving directories. Directories with associated access control lists (ACL) or trustee rights are archived when the files are archived. They are retrieved when the files are retrieved. Directories that are archived use the same archive description as the files that they are archived with. The archive GUI has a list of files in the same format as in the backup GUI. Select the files that you want to archive, and click Archive. You can also use the Find function to select files. The Find function has the same options as those to do a backup. The retrieve GUI looks like the restore GUI. Expand the directory tree so that it shows the client node name, and view the differences that archive packages introduced. When you retrieve a file, Tivoli Storage Manager sends a copy of the file to the client node. The archived file remains in server storage. You can retrieve archive copies from the directory tree. ARCHMC: Use this option to name the available management class in the active policy set of your policy domain. DELETEFILES: Use this option to delete archived files from your workstation after they are stored on the server. DESCRIPTION: Use this option to assign a description to a file when you archive it. If you do not remember the name of an archived file, you can use the DESCRIPTION option to retrieve the file. DIRSONLY: Use this option to back up and restore only the directories. FILESONLY: Use this option to back up and restore only the files. When you archive a symbolic link, Tivoli Storage Manager archives the file that the symbolic link points to. It does not archive path information for the directory. If you archive a symbolic link that points to a directory, Tivoli Storage Manager archives the files that the directory contains, under the name of the symbolic link. If the SUBDIR option is set to yes, Tivoli Storage Manager also archives the subdirectories, under the name of the symbolic link. You can use the retrieve command to retrieve files. Indicate the file that you want to retrieve and a destination. If you do not indicate a destination, the files are retrieved to their original location. You can use these command-line options to archive and retrieve files only or directories only. The default is archiving or retrieving both directories and files. DIRSOnly - Archive or retrieve only the directories and their attributes. FILESOnly - Archive or retrieve only the files and their attributes. 0 Comment to "9.3 Taking Archive and Retrieving Files"